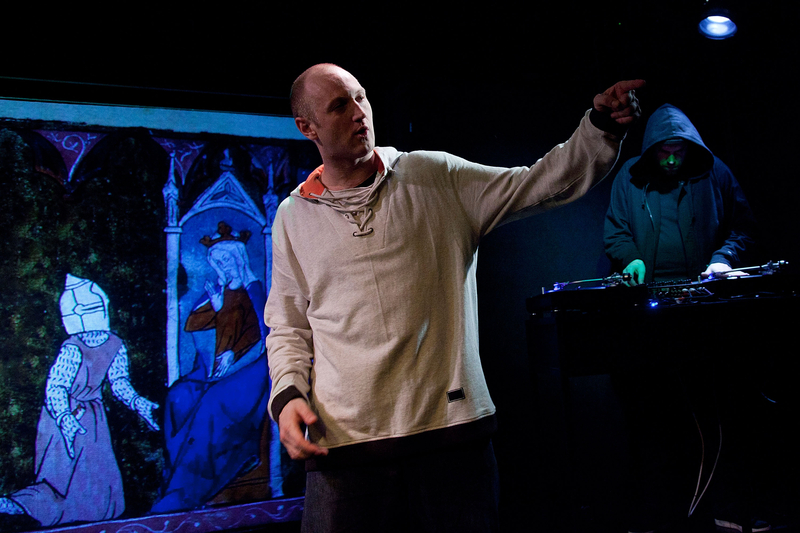 Rap artist Baba Brinkman performs great classics remixed, in his theater show Canterbury Tales Remixed. This weekend the show is in New York City, and it tours internationally. Whether experiencing the show as a purist or as a tourist, the performance rocks with vitality. The monologues begin with tales of the hero Gilgamesh from ancient Sumeria, one of the earliest tales known to mankind. From there Brinkman moves into selected Canterbury Tales and ends with a new interpretation of Beowulf. DJ Jamie Simmonds, aka @MrSimmondsMusic composes and plays his own sound creations as the live DJ throughout Baba Brinkman’s performance. As part of the show, video projections give a mix of ancient artifacts and pop culture art that enhance the simple stage. With only Baba, Simmonds and one stool, the live audience is transported around the world and through the ages. Words, as Baba says, make us immortal. At times bawdy, at times humorous, the show is always educational. I didn’t need the storyteller to urge me to read, read read – which he did at the end of the show – because the whole experience was a teaser to explore deeper literary treasures. Brinkman is unique, but credits among his influencers Chaucer, Seamus Heaney and rap storytellers like NAS and Missy Elliot. The Canterbury Tales is one of three related performances in Evolutionary Tales, a rap theater cycle at the Players Theater in the Village through June 23rd. If you are in the New York City area this coming weekend and can make the shows, you are in for an unforgettable good time.